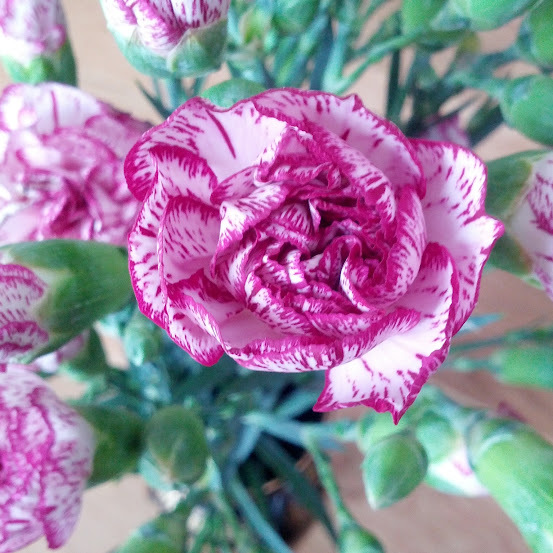 Bought a bunch of carnations just because. I feel like I’m running out of time. While most of the major things are now done, there are still bits and bobs left to sort out. My dress still isn’t complete. My shawl’s not done, but I am on the edging now, so that’s something. The seating plan display is about half done. Most of the RSVPs are in. I’ve picked a bunch of songs for the DJ to play at the reception. We have a photographer! So really, the only major thing left that I’m getting rather antsy about is my ring. We still haven’t bought that. We’re going with the Finnish tradition of having a simple engagement ring and a more show-y wedding ring. O wanted to make sure I liked the expensive ring, so I get to pick it! Very happy about that aspect of it. I have a good idea of the style I’d like, so now we just need to go find it. And to prove that I can talk about other stuff than just the wedding, I’ve won a book! I go through spurts of entering a bunch of Goodreads’ First Reads giveaways and yesterday’s efforts seemed to pay off. I just received a notification that I’ve won a copy of Ukrainian & Russian Bride Guide: Dangers & Joys Awaiting Western Men by Walter Parchomenko. I don’t think I’m quite the target audience for this book, but I did recently watch a documentary on Netflix called Love Me which was about the same topic. It’ll be interesting to see how the book tackles some of the problems the men in the documentary came across. I’ll post a review/link to my review on Goodreads once I’ve received the book and read it. This entry was posted in Personal and tagged wedding. Bookmark the permalink.